Gate Valve: A Good Choice for Your Application? Fluid flow control is an essential component of many industrial applications. Because of its prevalence, and the variety of applications, there are many types, sizes, and arrangements of flow control valves available to meet practically any need. The challenge for the specifying engineer is to select the valve type and arrangement that will provide the needed performance, while also fulfilling the need for safe performance and a desire for low maintenance burden. Sorting through the wide array of valves and targeting the correct valve technology or type can quickly narrow your focus to a much smaller circle of products to research and consider. Industrial gate valves, like all other valves, regulate fluid flow by reducing or expanding the area through which the process fluid must pass in a closed system. It is the manner in which that restricting area is changed that serves the major discriminating factor among the different valve types. In the case of a gate valve, a sliding round or rectangular piece, known as the gate or disc, is moved by a mechanism and transects the fluid flow path. Closing the gate, completely transecting the flow path, will restrict the flow to its fullest. As the gate is retracted and the opening size increases, flow is increasingly enabled. The movement of the gate, along with valve body and mechanism construction, give this valve type an array of positive and negative attributes. Low resistance to fluid flow when the valve is completely open. 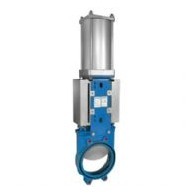 Generally, the cross sectional characteristics of a gate valve will mimic those of the connected piping system. Additionally, gate valves do not impose any change in the flow direction of the fluid as it passes through the valve body. Low force and energy requirements are needed to change the valve opening position (the position of the gate). Since gate movement is perpendicular to the direction of flow, it is not necessary for the mechanism to counteract the full pressure drop of the fluid in the system. Gate valves can be bi-directional, controlling flow in systems that may incorporate a reversal of the flow direction. 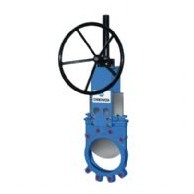 The installed gate valve is shorter in length than most other designs. Gate valves employ a slow closure rate. The accompanying slow reduction in fluid shutoff can inhibit physical shock (hammering) in the connected piping system. Things that appear as positives in favor of gate valve selection on one application may not be as desirable on another. Valve seals are exposed to the fluid flow when the valve is open. This might make the seals vulnerable to the wearing effects of entrained foreign matter or other components of the process fluid. The end result could potentially be prematurely worn sealing surfaces and a failure of the valve to seal properly. Gate valves are generally slow to open and close. This attribute might make them a poor selection for an application requiring rapid or immediate action. The gate valve will require an extended overhead service area, compared to other valve types. This may have an undesirable impact on locating the valve where desired. These, and other, very basic considerations may help point your product search in the right direction. One additional recommendation is that you contact an experienced valve specialist and take advantage of their knowledge and experience fulfilling other applications similar to yours. Explore the differing technologies and how they can be best applied to implement or improve your process. Experienced sales engineers can be a useful sounding board for discussing your needs. Take advantage of their extensive experience with a wide array of process applications. Selecting the right valve is not always an easy task, especially since it may be something that you do infrequently. Manufacturers often have knowledgeable local representatives that are experienced in this field and more than willing to contribute their expertise to your selection process.